Battle recap. Vermont Historical Gamer's Group. South Burlington, VT bunker. Skirmish at "Grandcamp" from Skirmish Campaigns' book, "Heroes of Omaha and Panzer Lehr"
About ninety American infantry plus one Sherman and a six-man HQ squad versus twenty-four Germans augmented by two MMGs plus one LMG plus one 50cm PAK and one six-man HQ squad. Americans moved quickly on their left and overwhelmed one German squad. Fierce close range firefights with Germans and Americans stumbling into each other led to decimation on both sides. On the US right flank fire from 1 MMG plus one full strength German squad completely decimated three US squads before they could close the distance. The Sherman and the PAK exchanged fire with no result. One American squad penetrated the courtyard but then was pinned down by German defenders in the house and could not return fire. 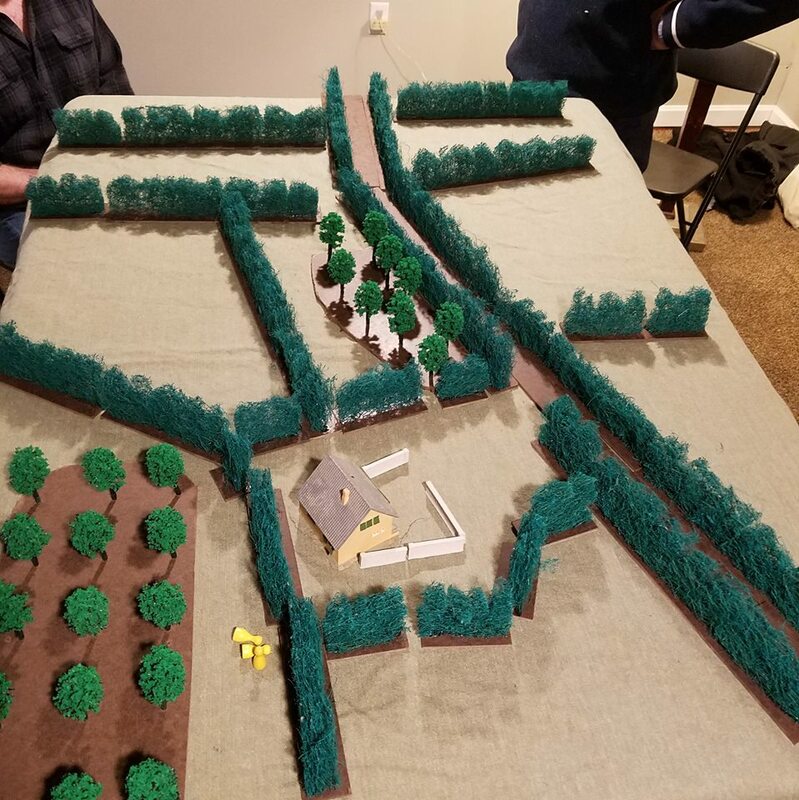 On the US left, two squads went down the flank with one squad overwhelming the PAK crew and then both squads moved on to engage in a protracted firefight with the remaining German defenders in the farmhouse. The Sherman eventually found a safer way to get in HE fire on the building and set it afire. On the 12th and last turn of the game, with the building on fire, Germans were forced to flee. 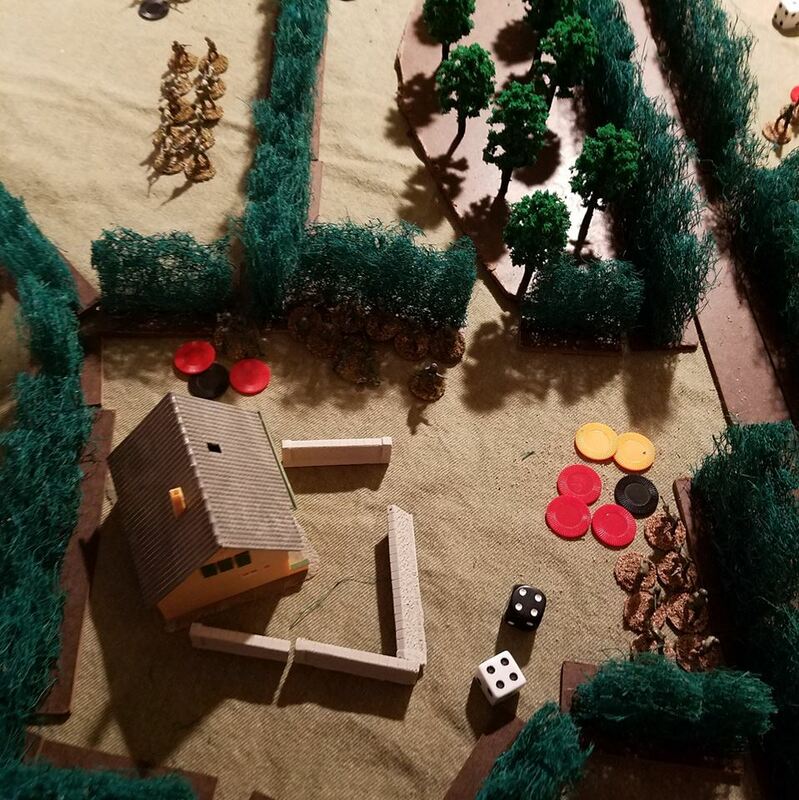 As they fled, a US sniper took out their 5th man, leaving the German squad with only four out of its original complement of eight and thus were rendered "combat ineffective." All in all, a very accurate historical representation of the intense and deadly nature of infantry vs. infantry combat in the Bocage of Normandy.